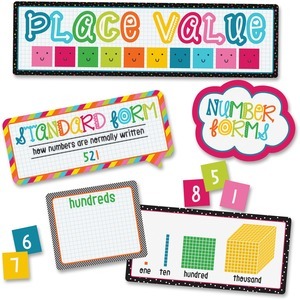 Add a colorful touch to your place value lessons with this 33-piece School Pop Place Value mini bulletin board set. This math set covers number forms, base-10 blocks and place value to the thousandths on colorful cards that feature smiling faces and a variety of bright patterns. It includes one large header, one small header, three definition cards, four base-10 block cards, four place value cards and 20 number cards. Content-rich decor enhances the learning process by reinforcing the lessons necessary for academic success. Ideal for small spaces, this curriculum-based set allows you to use valuable wall space for presenting standards-based concepts without sacrificing an inviting classroom atmosphere. It will appeal to your students, offering daily reinforcement that enhances the learning process. Be sure to look for coordinating products to create a cohesive classroom theme.